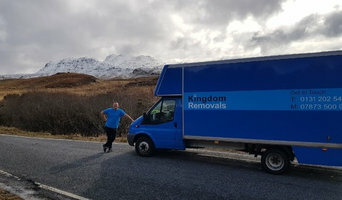 Kingdom Removals are a removals and storage company based in Edinburgh and also offer UK wide moving services and international relocation. Fully insured and licensed we offer very competitive prices for all your removal needs. From a large house to a single item a man in a van can see to your needs or our fully trained professional team for larger home removals. Kingdom removals also offer a full packaging service with customized boxes and all packing tape and materials to give our clients peace of mind. At kingdom removals, we make sure your flitting is hassle and stress-free. And for the majority of the time, we will send someone round on the same day as an inquiry comes in, for a free no obligation quote. Kingdom removals is a family run removal firm and have been established since 1975. Call us today for any and all removal needs. EH1 Removals is a professional office and home removals in Edinburgh company, offers complete range of commercial and office moving services. We offer reliable moving services with the experienced and qualified man and van professionals in the moving industry. EH1 Removals Edinburgh has been providing fast, careful, and fulfilling services at a lower cost that fits customer’s budget for all moves in Edinburgh. We always go the extra mile to take the stress and strain of moving day off your shoulders, and are dedicated to keeping our operation as environmentally friendly as possible. We have a comprehensive fleet of vehicles of varying sizes, giving us the ability to cater for any removal requirement. FOR ALL YOUR REMOVAL AND STORAGE NEEDS We offer removal and storage solutions throughout Scotland and beyond from our head office in Edinburgh. Fife UK Removals have been established since 2003 supplying removal/delivery solutions to our customers throughout the UK. The company is owned and managed by Mr William Laing who has steadily grown the company and now operates a modern fleet of vehicles employing highly trained and professional staff. Van Man Removals are more flexible than the larger Relocation companies; Offering same day, short notice, flat, House, office, business, long distance and student moves locally and nationwide. General transportation services including distribution & self storage in Edinburgh, Lothians, surrounding areas, simply ideal if just looking for small mover yet very knowledgeable van and driver hire in Edinburgh for an hour or two! Find companies in Heriot, Scottish Borders, UK that provide storage or moving services on Houzz. Scroll through this page to find a home removalist storage solution in your area. Just enter your suburb at the top of this page to narrow your search. Get contact information or message professionals directly so you can ask about rates, and read customer reviews.